Here is how the revised pension will be calculated as per the seventh pay commission pay matrix. This is applicable for all civilian pensioners who retire before 01-01-2016. 2.57 times the pension fixed at the time of implementation of the 6th pay commission. Let call this figure II. The pay band and grade pay corresponding to the last drawn pay has to be computed. 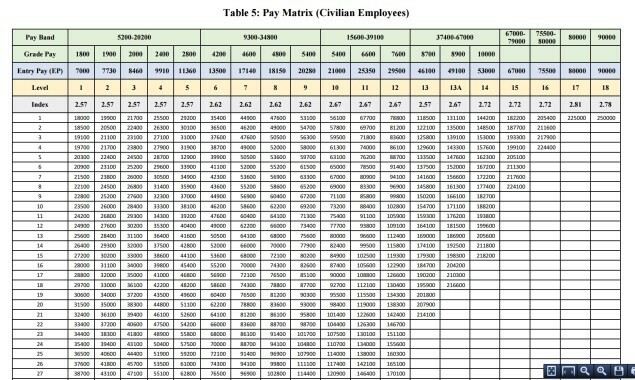 This will be used in the Pay Matrix (see below) and the revised basic salary corresponding to the minimum level will be determined. The number of increments earned by the retiree corresponding to the last drawn pay is then required. These increments at 3% each will be added to the revised basic salary determined in step 2. 50% of the amount determined above will be the revised pension. Call this figure II. If II is greater than the interim revised pension I, then II will be the revised pensio and corresponding arrears will be paid. If I is greater than II, then I will the revised pension. Suppose your pension fixed as per 6th PC is 10,000.
the lowest basic pay as per above pay matrix is 144200. This is the notional pay after 5 increments. Alternatively, one can simply move 5 rows down from 144200 in the pay martix to arrive at 167200. Thanks to Capt. A K Anand for pointing this out. 50% of this notional pay = 83,584. This is referred to as I. Since I is greater than II, I will be new revised pension. Initially, II will be given and then I will be paid with arrears.